We're halfway through 2017, and fittingly to the Chiefsplanet's 2017 Season Title, the Royals are all-in on what will likely be one final run with the current core. While many are worried the Royals will take a 2004 style tumble after this year, the farm system is hardly the barren wasteland it was during the Baird years. To see what's in the pipeline and what we have to look forward to, check out this exceptional list and analysis that Duncan put together of our system. While I had the honor of starting this thread this year, Duncan will always have a VIP pass to this OP, and can add more content at any time. 1. What is the threshold between being “buyers” and “sellers” at the deadline? In April, I argued that it would be a wise strategy for us to sell if we were 5 GB or worse, but that Dayton would likely add supplemental pieces for us to load up for another run if we were 1-2 GB. On July 24th, the Royals found themselves in sole possession of the 2nd wild card spot and 1.5 games back of the division. In April I said the Royals might pull the trigger on someone like Alex Cobb and resign Luke Hochevar, but since the Rays are also buyers and Luke's shoulder hasn't rebounded, this prediction hasn't come to fruition. Luckily, Dayton Moore again proved much more adept and creative than me by adding Trevor Cahill (good call, Duncan), Brandon Maurer and Ryan Buchter in a single trade. Giving us a solid starter to compete in 2017, and two relievers whom we will control through 2019 and 2021, respectively, keeping Moore's new vision through 2019-2020 intact. Moore has hinted that the Royals will continue to pursue the right deals if they're there, so the fun may not be over just yet. While we may not have the bullets to pull in a "star" like Cueto or Zo, Moore's adeptness may yet again net us what we need for another run in October. 2. Can Gordo and Moose bounce back to 2015 levels? In April I asked if Gordo could at least set the table at a 265/325/425 clip and if Moose could deliver damage around a 265/335/500 clip for an entire year. This season Mr. Moustakas has been the prospect that was promised, delivering at a 277/307/568 clip as of this update. Gordo, on the other hand, has put up an unbelievably abysmal line thus far. But, if there is a silver lining, it's that Gordo has performed at a 246/311/432 line since June 1st, and if he can continue to perform near that mark, he will be more than a valuable asset at the bottom of the lineup while he continues to provide the best LF defense in the league. 3. Can Ned Yost manage a bullpen? In April, I felt that despite the poor start, Royals bullpen would ultimately be "solid" this year, but the question was whether "solid" was good enough for Ned. I argued that the Royals needed Soria to bounce back and that Ned would need to start being strategic in his L/L and R/R matchups. While Ned has still made at times baffling and frustrating decisions with his starters (such as allowing Travis Wood to try to "get the win" and still insisting on sending Hammel out for the 6th, he's mostly done a good job). MASH: Minor/Moylan - Alexander - Soria - Herrera (Credit to C3HIEF3S for the origins of the phrase) have cemented into reliable pieces, and now that Herrera is showing signs of stabilizing, our dumping of Wood, our call up Flynn, and the acquisition of Buchter and Maurer, the Royals have the potential to enter October with one of the best and deepest bullpens in the postseason. 4. Will the Royals find a boost from an unexpected X-Factor to lift them to contention? Cool-Whit, Boni, Mike ****ing Minor, and Alexander have come up huge thus far. Cool Whit is, incredibly, is second on the team in WAR and has more than replaced Zo's presence on the team. They, like the X-Factors on the 2014-2015 teams, have been critical cogs as we've raced back to contention, while Cool-Whit and Boni also have provided a rosier outlook for this team's future. It's worth noting that Salvador Perez and Jason Vargas has been beasts on offense and the mound (along with Sal providing his customary defensive excellence), but I am still a bit wary of Salvy's annual Yost assisted offensive drought as the team moves into August, along with Vargy regressing to his averages. 5. Can Jorge Soler and Brandon Moss be productive contributors in Kauffman’s dimensions? Ouch, no, but the Royals shift to power-hitting in the juiced ball era looks like one that will pay off. Thankfully, Moss is showing signs of entering his seasonal hot streak where he becomes corn-fed Jesus for a month, and we'll need him hot to keep up with Cleveland down the stretch. While Jorge has been painful to watch in the majors, his scorching performance in AAA should give one a bright hope for the future. While some may disagree, I offer Moose, Hos, Gordo, and Duffy's struggles as exhibit A for why it is far too early to give up on Soler's potential. Bonus Question - Is Raul Mondesi truly ready to be an everyday player? Ha! Not even close. However, like Soler, his progress in AAA is incredibly encouraging. With ceilings like Lindor and floors being Esky being thrown out there, it's hard not to be excited about his future. There are many reasons to be excited, and not only for 2017. The Royals emergence of Cool Whit, Bonifacio, and Scott Alexander, and the fact that we have pieces like Salvador Perez, Danny Duffy, Kelvin Herrera, Jorge Soler, Ryan Buchter, Brandon Maurer Cheslor Cuthbert, and Raul Mondesi until at least 2019 should leave one feeling pretty optimistic. Re-up Moose or Hos (and heck, re-sign Dyson while we're at it), and suddenly this team looks very much like one that could compete for the indefinite future. The Royals are all in again, buckle in and enjoy the ride. I want to kick off this thing by thanking everyone who nominated me to construct this thread. As someone who started lurking this board at 14, it is a legitimate honor for me to write the Royals' Repository for the entire 2017 season. For those of you not interested in reading the 2011 prelude I wrote leading up to this season, feel free to scroll down to the "2017" section of this thread. I likely will spoiler the 2011 section as the season gets going. Without further ado (thanks, PB) let's do this thing. I remember this time in my life well. I just graduated high school, was working full time at Applebee’s, and had my first serious girlfriend. The time between the closure of my high school life and the onset of my time at KU seemed to last for years. It was the first time I experienced a summer that felt close to the one Bryan Adams described in the “Dad Rock” classic, “Summer of 69’.” In spite of how monumental that time in my life was personally, something that shines just as bright was that this was the first time in my life that a legitimate hope permeated through the Royals' fanbase. For years I followed the team through Alnorth’s posts on Chiefsplanet, Rob and Rany’s conversations, and GeorgeBlowfish’s reflections on his website, and things felt generally grim. Any hope was restricted to those grainy, 120p videos of Hos, Moose and Myers taking AB’s in A-ball. The conversations in Al’s Gamethreads on the Royals (with updated box scores!) would often turn to how the young pups were doing in the minors once Kyle Davies, Sean O’ Sullivan, or Jeff Francis were blasted for 7 runs. Even then, hope felt often thin. Hosmer and Moose, deemed our future stars, struggled in A ball, culminating in Hosmer requiring Lasik surgery. The troubles were not limited to our hitters, out of our trio of “sure thing” left handed prospects (Mike Montgomery, Chris Dwyer and Danny Duffy), Monty and Dwyer flamed out, and Danny temporarily quit baseball altogether. However, by the end of 2011, the doubt and cynicism that had gripped the Royals’ kingdom since the death of Ewing Kauffman was starting to be replaced by something else - promise. Salvy, Hosmer, Moose, Cain, Esky, Duffy, Holland and Herrera all made their major league debuts with the Royals, and that neglects the rebirth of Alex Gordon, who more than made due on his (derided) promise to dominate after being forced to give up his position for a younger and more exciting prospect (Moose). “At various points, Moustakas, Hosmer, Montgomery, Lamb and Duffy [...] stirred long-dormant images of Brett, Frank White, Bret Saberhagen, Willie Wilson and Dan Quisenberry. "We'd sit around and project what might happen in a few years," Hosmer says. "Everything we talked about had to do with bringing a championship back to Kansas City. This group can't wait to get it going." [...] If they build a statue to symbolize the 2015 World Champion Royals, the model will be Hosmer, the third pick of the 2008 draft." Look forward to following the Royals on this board, and I agree with the sentiment in the 2011 thread that CP is the best board for Royals talk (though the Scout board is OK, too). I started following the team during Tony Pena’s “Believe” run in 2003. I was born in 1992. By the time I was a fan, the figures of Brett, White and Sabes felt like romanticized gunslingers of the American West. I never followed the Royals with the hope they'd win it all, rather, the voices of Denny and Ryan were just consistent staples of my Summer, and occasionally they'd even win a game. October baseball may as well been a different sport entirely, because the thought of the Royals participating in the event was as ridiculous as imagining the Wranglers doing it. But in 2011, that possibility began to feel real, and the knowledge that we’d have this core for six years.. I mean, 2017 felt like forever away. Somehow, forever is already here. I write this now from Colorado Springs. I graduated from KU, I moved out with a new (and who may be my forever) girlfriend, and moved on from Applebee’s to become a Teacher (I'm composing this from my presently empty classroom). This season the Royals kingdom on Chiefsplanet comes together to see our core make one last ride. The 2017 season undoubtably begins in shadow of Yordano Ventura’s tragic death in the offseason. David Glass again bucked expectation and fan vitriol to go all in on his budget, and the core, despite the heartstring tugging trades of Davis and Dyson, remains primed for another push to the promised land. Will the Royals make another deep run into October? Or will they conduct the largest deadline sell off in Major League history? Even with the expectations, predictions and hype spanning back from 2011 - the journey this team embarked on since 2013 was sweeter than anything any of us could have imagined. Even if this team goes on a 2004 styled losing binge this year, all is not lost. As this will push the Royals to conduct a sell off for minor league talent that will reignite the incredible optimism that permeated through this place in 2011. At the end of the day, this team actually did it, they somehow found a way to defy all of the odds that the MLB set against them to take the crown. 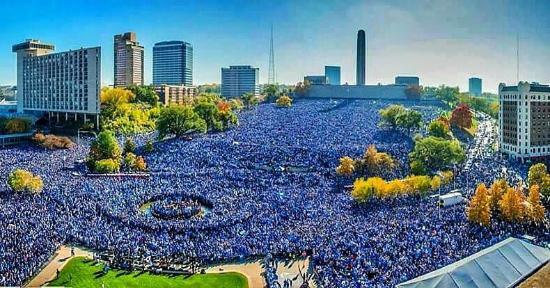 After this year, we stand to lose cornerstones of the Royals resurgence and other critical pieces to our success. Eric Hosmer, Mike Moustakas, Lorenzo Cain, Alcides Escobar, and potentially reliable pieces such as Ian Kennedy and Jason Vargas stand to move to "greener" (I.E. BIG MONEY) pastures. The question looming over the Royals and opposing front offices is where will the Royals be sitting this summer? I think the most important question is what is the threshold in GMDM’s mind is between being buyers or sellers at the deadline. If we're 5 back at the deadline and the team is in a similar position to the 2016 team, I think this would be the worst possible directions for GMDM would be settle for our old friend "Jack Schitt". Yes, the Royals would be able to get sandwich 1st round draft picks for their departing players who received 50m dollar contracts in the offseason. However, we only have two players who are locks to do this. Sure, Lorenzo Cain and I suppose Ian Kennedy could too, but if Cain gets hurt again (at 32) and Ian reverts to a “decent” season, it’s a considerable stretch that either gets a 50m dollar deal. I know, first round picks are great - and Moore could still rebuild from getting those picks alone, but I’ve lost faith in Moore’s ability to draft reliably. Let’s look at his first round picks since 2009. Ouch. I know Finnegan, Manaea and Odorizzi were pitchers that developed in the Royals system, however, if Finny and Odo “make it” as starters, much of that will come from pitches they learned in other organizations. Since 2006, Moore has arguably only developed two starters in the Royals system (Duffy and Ventura, yes, Ventura counts, any pitcher who dominates in the 2014 World Series and 2015 ALCS counts). But the fact is, Moore has relied on the currency of drafting pitchers to give him the pieces needed for a contending team. This strategy in no way will be able to rebuild a new team. Factor in the new restrictions to signing Latin American players that the Royals utilized to rise to prominence, and the odds are stacked against Moore conducting another successful rebuild. I think the wisest strategy would be GMDM doing a mass sell off of his assets at the deadline. The Royals will need some luck in their favor, such as the 2011 core performing at their beast mode 2015 levels, the reliever fervor we saw at last year’s deadline for Herrera or a bidding war for Hos, Moose or Cain’s services. Esky and even a productive Vargas (at his rate), could net a marginal return or a couple lotto tickets as well. Getting a Greinke like return for trading our pieces could allow us to build around the pieces of Duffy, Karns, Herrera (if he stays) Soler, Cuthbert, Dozier, Boni and Mondesi to potentially make some noise in 2019-2020, I don’t know if that turnaround is possible if we rely on the draft. In this scenario, I wouldn’t be surprised if we landed a starter in the vein of Alex Cobb, Junior Guerra, or Chris Tillman. I also wouldn’t be surprised if we pulled the trigger on a midsummer return of Luke Hochevar to give our bullpen a boost down the stretch. Can Gordo at least set the table at a 265/325/425 clip and can Moose deliver damage around a 265/335/500 clip for an entire year? If they produce at the top of the lineup around this level, it would set the tone for our offense and would exponentially increase this team’s chances to contend. If the 2017 team is going to compete, than it is critical that our offense is at least comparable to the beast mode 2015 team. It’s obviously not going to be the contact team we’re accustomed to with the acquisitions of Moss and Soler, but with only a decent starting rotation and the departure of our borgpen, this team has to produce runs. Two big cogs in that equation are Moose and Gordo. Whether or not Ned can manage a merely solid bullpen is a big question looming over our contention if our offense comes around. I do not believe the Royals pen is as much of a disaster as its seemed at the beginning of the 2017 season. In 2014, experts said the Royals one weakness was its “soft” bullpen that would give it trouble through the 2014 year - and the experts of CP agreed. We constantly bemoaned the “useless’ Davis and “gascan” Herrera. Funny that the main criticism of that team ended up being one of the most dominant bullpens in Major League history. I don’t think this team will have one of the best bullpens ever. I think it will be “solid”. As hated as he is, the Royals need Soria to bounce back in a major way. So far, he's hitting a career high 95mph on the gun, whether he's Roidkeiming it or is risking for a third trip to Dr. Andrews to bounce back remains to be seen, but him returning to his 2015 production (like many other Royals) would be huge. Thanks to his history during the Royals dark times. I do hope that he does manage a winning season on this roster. While I expect the bullpen to be "good", it won't be Yost-proof. For this team to be successful, Yost is going to have to do things such as matching up lefties and righties, leaving pitchers in for multiple innings, and being more aggressive with his pitchers... Strategies he's been resistant to his whole career. 2014 X factors - Wade Davis, Kelvin Herrera, "Ace" Ventura and Brandon Finnegan. Even if this roster competes at a solid level, I don’t think our rotation and bullpen is dominant enough to compete in September. Since we lack the farm to net a Cueto and Zo for a championship that no one will remember, we likely will need a couple of unexpected pieces to emerge through the season. This surprisingly isn’t too much to ask. The Royals fell backasswards into one of the greatest relievers of all time in 2014, and asked a Rookie to replace Ervin Santana’s 2014 production, and Ace Ventura did just that. He could have easily pulled a 2017 Strahm or understandably put up 2016 numbers, but the man championed that year. The 2017 Royals need similar good fortune to compete. Can either Staumont or Strahm emerge as an underscouted, hard throwing starter in the vein of Steven Matz for the 2015 Mets? Can either Staumont or Zimmer emerge as an underscouted, hard throwing and dominant piece to a September bullpen, ala Brandon Finnegan? Can Karns have a 2014 Yordano-esque breakthrough in the rotation? Is there any way Mondesi defy the odds and breakthrough for his sophomore campaign? A huge year from Mondesi would improve our outlook in a hurry. Can Cuthbert's bat force his way into the lineup on a regular basis? Can someone, anyone in our system emerge in a similar fashion? If the Royals are going to turn it around and compete, they need some pieces to emerge to seriously make a run this October. We may still have our core pieces, but team contact is long gone. These two players were brought on for one thing, power. These uncharacteristic GMDM acquisitions give further credence to the juiced ball theory and were done with hope the Royals can compete the the power hitting seen around the league. In order for this offense to threaten opposing teams, it would be great if Moss can at least produce at his 2016 levels and our new acquisition from the Greinke Tree (shoutout to C3HIEF3S for the term) became the Wil Myers hyped prospect he was supposed to be. This organization is desperate for Mondesi to became the generational player they’ve scouted him as since he was too young for a driver’s license. It’s easy to see what they see in him, his athleticism is like watching poetry in motion and if he puts it together on offense he's going to be a KC star in the vein of Gordo and Perez. His roasting of the ball in Spring Training and his home run this season have shown unexpected and surprising power. Though 2B for the Royals has been a perpetual black hole since the departure of Frank White (the 3 month affair with Zo notwithstanding), hitting at Tony Pena Jr. numbers is simply unacceptable, even at the bottom of the lineup. Is it too much to ask for Mondesi to at least produce 240/290/330 numbers to be a contributor to the offense? Last edited by Chiefspants; 08-02-2017 at 01:53 PM..
Last season it seemed we were always playing at .500 or trying to get back to .500. We really could use a nice winning streak before we far much further back so that we aren't constantly playing catch up in the standings. I'm good with one more run, but we do not need to be floating around .500 at the deadline. We need to be up and have a high likelihood of a playoff spot or we need to sell. I still want to resign moose and cain, but we have got to get something for these guys if we aren't going to. Other than playoffs, have Moose and Hosmer ever lived up to their alleged 'star' status? The batting coach should be fired for letting these guys swing like they have been. Watched the game last night- Gordo swinging wild at anything and Hos was swinging at chest-high fastballs. Salvy swung at a first pitch in the dirt for a tapper back to the pitcher. It was brutal. This might be the worst hitting team in recent Royals history. No patience at all at the plate. Other than landing on the moon, did Neil Armstrong ever amount to anything? There's a lot of wasted money on that list. I'm not sure anyone outside of KC sees either of them as "stars." When KC won the WS, I think most people were surprised because this team didn't have a superstar. Somebody just beat elusiveduecedropper and #petethingz in the "I'm going over the top with the most incredible stupid comment in this thread" contest. Way to take the lead. It will be fun reading this. It's like reading version of the "ketchup, mustard, relish" races. Somebody will stretch for the tape soon. Knew I should have read just a little more.